Brittle star Macrophiothrix sp., Lembeh Strait, North Sulawesi Indonesia. Image: Werner Fiedler. Brittle stars are not as well known as the starfishes. Many hobbyists consider both to be representatives of the same group, but these are two different classes of animal: Ophiuroidea (brittle stars) and Asteroidea (starfishes). The similarity in body shape is due to the fact that they have common ancestors. 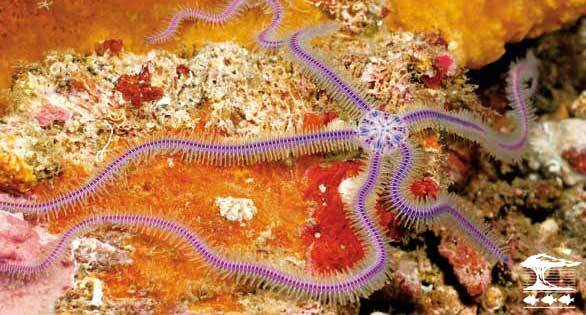 Purple Brittle Star, Ophiothrix purpureus, on sea fan. 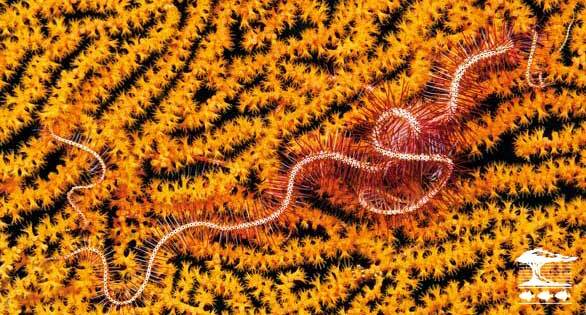 The main difference between them is that brittle stars have graceful, snake-like arms that they can twist sideways. (For this reason, some call them “serpent starfishes.”) Starfishes lack this great flexibility and many species cannot move their arms laterally at all. Another very striking difference is that starfishes do not noticeably change their body shape when moving around. They glide stiffly in slow motion, so that they are hardly recognizable as prey by their predators. The only parts that move are the countless tiny tube feet on the underside. Brittle stars use a different strategy: they rely on rapid movements and can escape very quickly to hide under a rock or in a crevice. They can literally “run” over the ground with their arms. 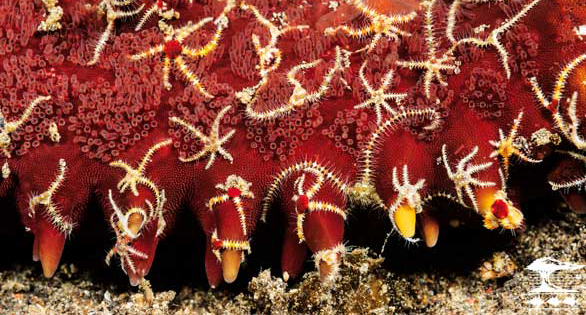 A profusion of tiny Ophiothelia brittle stars on a knobbed starfish, Protoreaster sp. A recent discovery by the American evolutionary biologist Henry Astley shows how little we know about these fascinating animals. Based on observations of fleeing brittle stars, it was thought that they moved all five arms at the same time as they “ran.” It was unclear whether animals without bilateral symmetry—in which the body is symmetrical and has a right and left side—are able to distinguish between left and right. Astley decided to check this on echinoderms with a five-pointed circular symmetry, referred to in biology as “pentaradial symmetry.” During an expedition to Belize, he found numerous specimens of the brittle star Ophiocoma echinata and observed their locomotion. He began to suspect that the five arms played different roles. To examine this more closely, he set up an inflatable kiddie pool, covered the bottom with sand, and filled it with sea water. In this makeshift laboratory aquarium, he was able to film the brittle stars extensively when they tried to withdraw from an exposed zone to a hiding place. 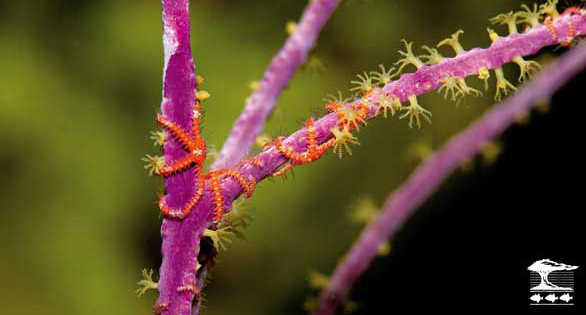 Ophiothela brittle stars on a gorgonian in a reef aquarium. Image: Daniel Knop. When Astley evaluated the video clips, one thing became clear: while these animals have a round body shape and a nervous system that is also ring-shaped, when they move they behave like animals with bilateral symmetry—they walk on two legs or arms. One of the arms performs a guiding function: it determines the direction of movement. Two neighboring arms perform the locomotion by sliding forward, lifting the body, and hauling it in that direction. The two rear arms are only dragged along and do not actively support the movement. 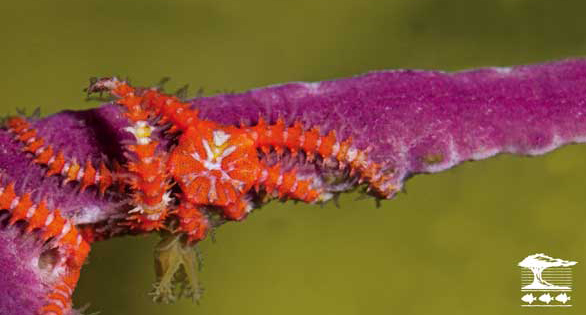 Tiny Ophiothela brittle star on purple gorgonian. Image: Daniel Knop. Astley, H. 2012. Getting around when you’re round: Quantitative analysis of the locomotion of the blunt-spined brittle star, Ophiocoma echinata. J Exp Biol, http://jeb.biologists.org/cgi/content/full/215/11/1923/DC1.